Marissa Delgado has been in the culinary industry for over 8 years. 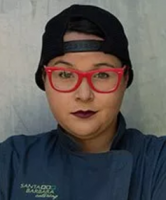 Her passions for quality ingredients, creative cuisine, and unique food styling has lead her to the Executive Sous Chef position at Artisan by Santa Barbara Catering in Tempe, Ariz. Marissa was most recently featured on Food Network’s Chopped, where she was dubbed “The Flavor Master” in her episode. Marissa graduated from the Le Cordon Bleu College of Culinary Arts in Scottsdale with an Associates in Patisserie and Baking. Marissa began her career at The Broadmoor Colorado Springs, a Forbes Five-Star and AAA Five-Diamond resort with impeccable service and distinctive amenities. During her time at this highly recognized resort, Marissa furthered her pastry and catering skills. Marissa returned to Phoenix and sought a rewarding position with one of Arizona’s top catering companies, Artisan by Santa Barbara Catering. Her enthusiasm for teaching others and advanced culinary skills throughout the kitchen, Marissa was quickly advanced to a manager position. With her leadership, Artisan by Santa Barbara Catering has been named Number One Caterer by Ranking Arizona, Caterer of the Year by International Caterers Association, and many more through the years. Marissa’s career endeavors now include external education and mentorship throughout the local and national industry. Her passion projects include curing her own meats, creating unique spice blends, and brewing her own varietals of beer.